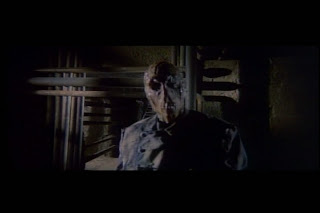 When Lucio Fulci discovered Elisa Briganti’s story for “House by the Cemetery” (1981) he must have gone absolutely nuts. I mean, here was a work that managed to blend the giallo with the zombie flick, which is like a used helicopter salesman telling me that my Apache can double as a submarine. What’s not to love? Well there’s the bad editing, the poor acting, the unfulfilled potential and all that. But still, this material fits Fulci like the black leather glove of a sadistic killer and it remains one of his most popular films. Dr. Norman Boyle (Paolo Malco) moves into a new Boston house with his wife and son. However, this is no ordinary house; it’s one by a cemetery. The previous owner was a researcher who hung himself. 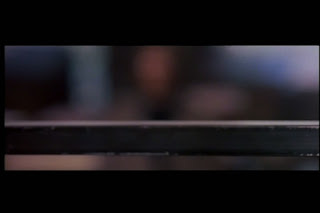 A fact revealed by a minor character who exists only to say, “Do you want to see where he killed himself… RIGHT THERE!” accompanied by the world’s most dramatic focus pull ever bestowed upon a handrail. The house has an even older history that the former occupant was investigating when he went mad, involving a man named Dr. Freudstein who conducted terrible medical experiments. Not surprisingly, the realtors downplay this portion of the local history. “Freudstein,” incidentally, is my favorite name for a fictional medical professional since the Argentinean sci-fi sexploitation disaster, “The Curious Dr. Humpp” (1971). The family quickly notices several strange things, such as the stone grave imbedded in the wooden floor under one of the rugs. Apparently it is “common practice in Boston” to bury the dead indoors during the winter when the ground is hard. Also there is the creepy babysitter who rarely speaks, never actually watches the son and has evil eyebrows. Next to common sense, the thing that could most help these luckless characters is a doorstop. Even after the fifth or sixth iteration, they still don’t seem to realize that the door shuts and locks itself behind them. Though the easiest to solve, this is the least of the problems involving plot and motivation. More on that at the end, in the spoilers section. On the technical side, this film is only barely passable. Fulci’s editing is arbitrary and generally uninteresting while his visual sense only seems to wake up when handling the death and gore. There’s a fair bit of stabbing and puncturing courtesy of a sharp-edged implements rack that the killer keeps close at hand. Fulci’s most painful slaying to watch provides an important lesson on why we should all stab with quick jerks rather than gradual pressure. Ow. 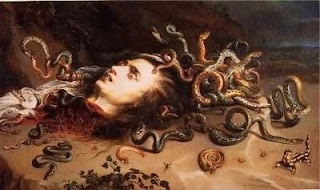 Severed heads and limbs are also a highlight and the subject for my giallo screenshot/artwork comparison; I’m making a bit of a stretch and using an older painting, “Madusa,” by Dutch master Rubens. The murders, while gruesome, are offered without much guilt or consequence since we have little reason to care for these characters. 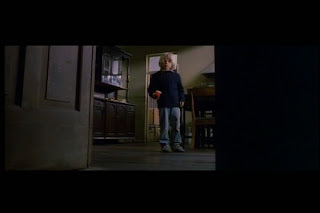 The enormous amount of danger and trauma the child actor is placed into seems pretty tasteless, but his whiny dub and inexcusable stupidity ensure emotional distance. One nice coup is the score by Walter Rizzati that has room for both subtle mood peices and shameless bursts of beat-based techno-disco stuff. 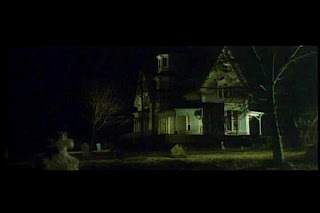 Ultimately, “House by the Cemetery” is a film whose reputation and relative fame is probably undeserved. There are better films in both the giallo and zombie subgenres, and even ones directed by Fulci. The ending finale is quite good, and the gore should sustain the average cinematic vampire, yet even the death sequences lack the ingenuity of good Argento or the tension of better thrillers. Still, this movie is undeniably fun and should work best if viewed in a group. The plot holes is this film almost defy enumeration, but I will point out some of the most atrocious. Most have to do with the ill-conceived basement, magically free of the overwhelming stench of multiple rotting corpses. Also, it has a staircase that leads up to the indoor grave, which makes no sense from either side: there is no body and the stone is too heavy to move. As far as the characters go, we actually witness the babysitter suspiciously mopping up gallons of blood from the most recent victim even though we eventually discover she knows nothing about the murders. 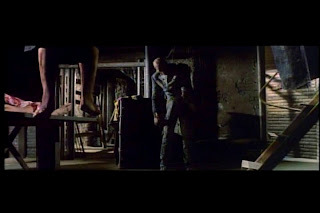 Then there’s the suicide of the previous owner at his job, when he should have been easy bait for the killer (he was living in the house alone…). Finally, the ending which involves a woman, possibly a ghost, coming out of nowhere and walking away into the sunset with the only survivor. Um… what? That ending was the most "wtf" ending I can remember. "Ooooh, so that means...wait, no, what? That couldn't have worked. Maybe...oh, what the hell." "The plot holes is this film almost defy enumeration." I heartily agree. Besides which, who names their obnoxious, toy weapon wielding child 'Bob' anyway? In other Italian horror news, I just saw the UK premier of The Last House in the Woods (Il Bosco Fuori) at Sci-Fi London's Cine-Excess. It's a new splatter film from young director Gabriele Albanesi, consciously inspired by the works of Fulci, Bava, Argento and innumerable non-Italian horror auterus of the 1970s and graced with special effects as a favor from Sergio Stivaletti (Phenomena, Demons, etc), who apparently said he had never used so much fake blood. Although unsurprisingly ridiculous at times, the plot is simple enough to avoid the jaw dropping incomprehensibility of movies like House by the Cemetery. The film is nastily gory, but also tense and darkly atmospheric, though the occasional brightly lit scene distractinly reveals some of the sparseness of its budget. Although this film is rather high in blatant references to older horror movies, I recommend it as entertaining, if not astoundingly innovative, genre fare. 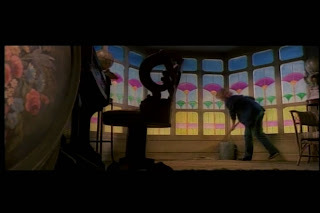 It even has a mysterious forbidden cellar, lit in Bava pink and blue. Look for a DVD release. Yeah, I think it's a shame that a movie with a premise/twist this good(? ), can't keep the plot together well enough to sell the material. Still a fun flick. I look forward to "The Last House in the Woods." I don't know if you've met Prof Scott Diffrient, but I think he was at Cine-Excess also. He's a great guy and know his cult cinema well. Also spoke to professor Paul recently and he mentioned you out of the blue as one of the only people that he felt understood "There's Something About Mary." He had lots of good things to say about you. Glad you had a good time at Cine-Excess. Wish I could have been there too! Keep up the fun-making. Great review, it really sounded like you had fun writing it. It's a hair different from the purely analytical stance I usually see from you. This movie also sounds like it'd be terrific fun to watch with a crowd. I recently was turned on to a British series that poked fun at old horror TV series called "Darkplace." Set in the titular hospital, it concerns itself with the daily trials, tribulations and supernatural phenomena that occurs to Dr. Rick Dagless M.D. and his cohorts. 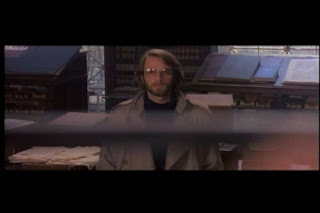 The whole thing is framed as a failed television project spearheaded by horror novel hack Garth Marenghi and he has constant references to his own products in the show. I found it to be absolutely hilarious (especially the second episode which focuses around amazingly sexist remarks) and thought you might too. Not a big fan either, but there is a fnatastic review on braineater.com which (almost) makes me want to change my mind and which offers a rahter intriguing explanation for the plotholes. Definitely a great review. While I don't buy much of the subtext discussed (Fulci is given a lot of credit), the Freudian readings are very scholarly and intriguing. I'd be interested to hear Fulci explain the movie so that we could learn what were plot holes and what were intentional ambiguities. I think Fulci is the rare case of an artist with subpar abilities as a craftsman, whereas the far more common type seems to be the competent director who fancies himself an artist, but doesn't really have that much to say. If you only think of Fulci the director, I'd have to agree with you - the review seems to give him way too much credit. However, if you look at Fulci's interviews, reviews, etc. on other people's work and subjects other than movies, I think he demonstates enough knowledge and intelligence to make the subtext discussion (on the braineater site) far more credible than one might initially think.